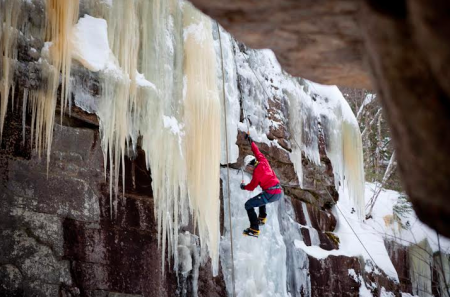 MWV Ice Fest, Back in Action! I know that we are still wearing shorts and rock shoes, but we just can’t help ourselves – we’re already psyched for winter. Especially since this year marks the 25th annual Mount Washington Valley Ice Fest! One thing that always gets us going in the fall is the design and unveiling of this year’s poster and graphics. Like we have for many years, we are again featuring the artwork of the incredible Randy Rackliff. Randy says that he made the original woodcut around that time that he first met and climbed with Alex Lowe. After Alex’s passing, Randy’s wife secretly sent the original to Alex’s wife, Jenny. For years, Randy had no idea where the piece was until one day he saw a short Black Diamond video about Conrad Anker’s gear closet. Check out Randy’s work making a cameo appearance around the 1:00 minute mark. And then check out more of Randy’s work at Cold Cold World. 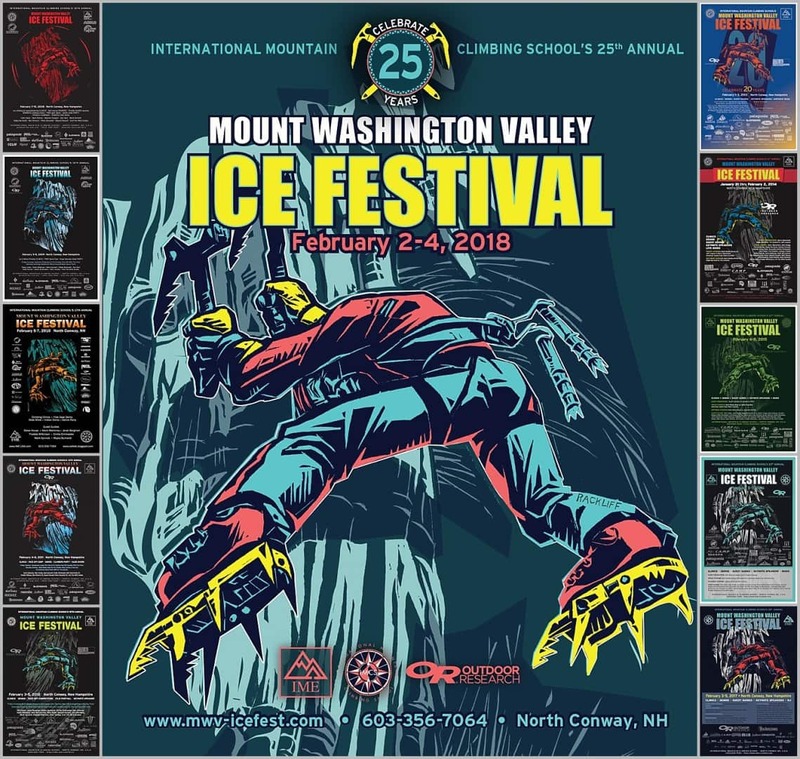 Years and years of MWV Ice Fest Posters. 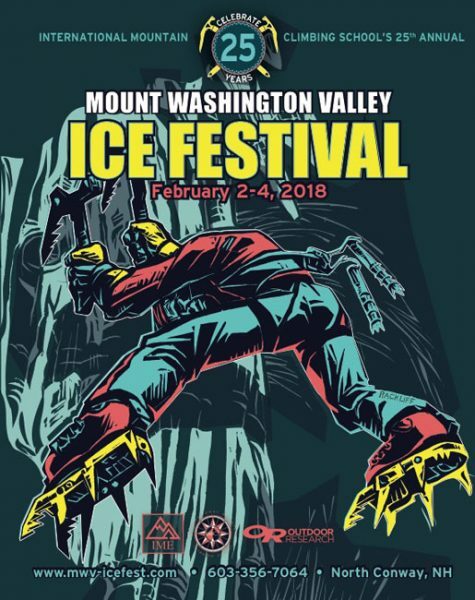 The MWV Ice Fest team is deep in the planning phases, so stay tuned to the blog, Facebook, and Instagram in the coming months for updates on sponsors, guides, and evening events. Black Diamond is back! And they are bringing with them HEAPS of gear for you to try out! Black Diamond creates top-notch gear that we all routinely carry into the hills, and beyond that, they continue to support keeping those hills accessible for us to walk into! 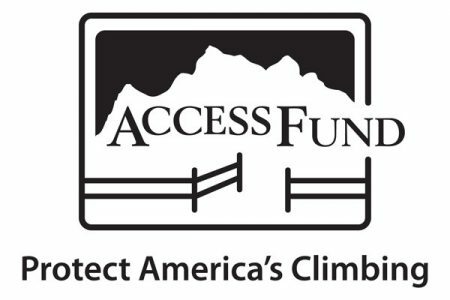 The company stands behind the climbing and skiing communities in a myriad of ways, including advocating for conservation projects like the recent Bears Ears National Monument, and supporting avalanche awareness and grant opportunities in the climbing world. Their continued support for the MWV Ice Fest and its participants is just another testament to their commitment to our community. 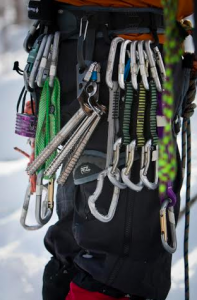 Be sure to stop by the Black Diamond table to grab some of their classically awesome climbing gear, and to thank BD for being such an awesome presence in our community! 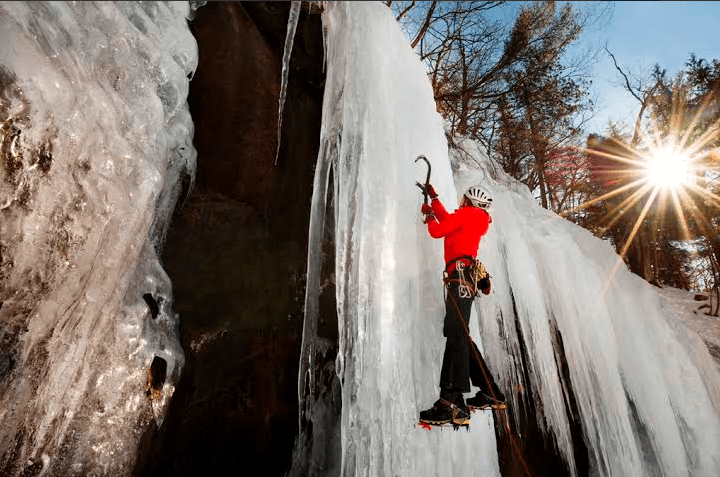 New to Ice Fest – Scarpa! Let the gratitude continue! 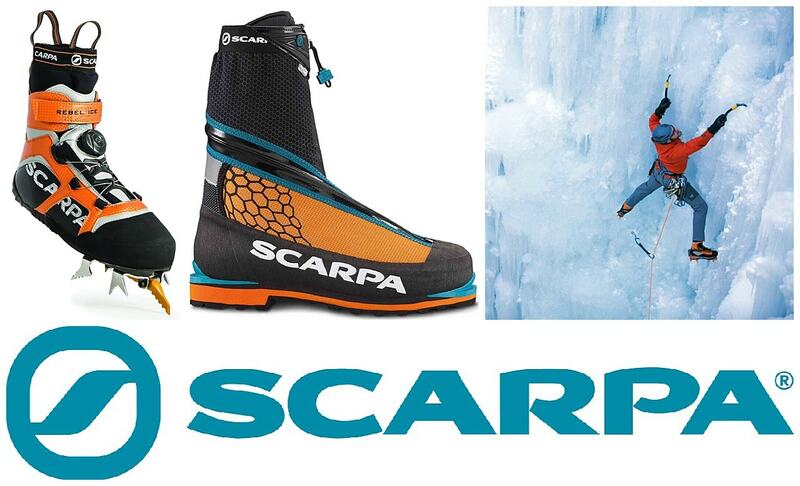 This morning we are thankful for ice in Tuck’s and for the latest addition to the Ice Fest family – Scarpa! They may be new to Ice Fest, but we’ve been seeing their boots on happy climbers’ feet for years. This year, be sure to welcome them by taking their boots out for a tour! The Phantom Tech, the Rebel Ice, the Rebel Pro GTX, and the Mont Blanc Pro GTX will all be available for your daily kicking pleasure. You too will be thankful for warm feet and easy footwork when you rock a pair of Scarpa boots! The good news coming out of the chilly Ice Fest headquarters this morning is not only that there is snow on the peaks and cold temps in the forecast, but that CAMP and CAMP Athlete, Ian Osteyee, are back on the Ice Fest roster! CAMP is well known for the innovative, lightweight climbing gear that they began designing 125 years ago in the mountains of Northern Italy. That gear sure comes in handy here in the White Mountains where shaving ounces really counts. 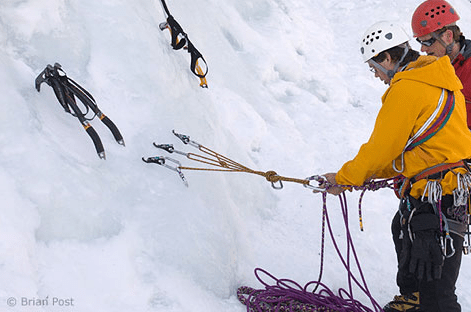 Whether you’re heading out for an alpine climb on Mount Washington or learning the nuances of thin ice at Frankenstein, be sure to grab some CAMP demo gear to make the approach and the send that much easier! Welcome back Ian and CAMP! It’s Not too Late to Sign Up for Clinics! We are headed into the final few days before Ice Fest, and things are filling up! If you haven’t pulled the trigger on registering for a clinic yet, now’s the time! Check out the clinics below that are still open for registration, and pick one out! Come join the fun! This clinic is sure to fill quickly! 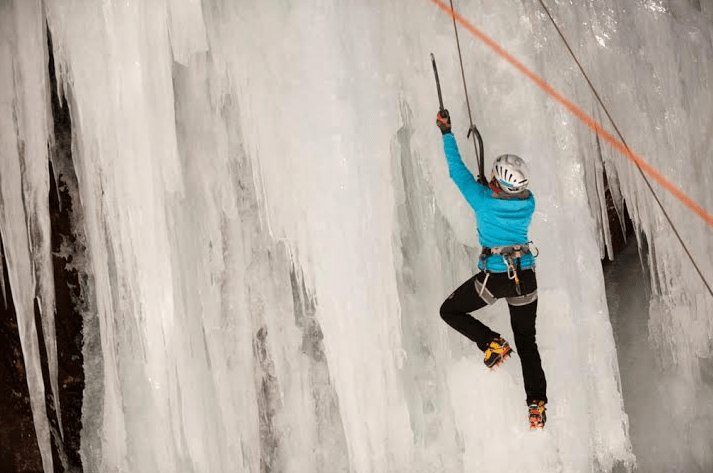 Learn how to move smoothly and confidently up vertical ice without getting pumped. Space available: Friday, Saturday and Sunday!!! 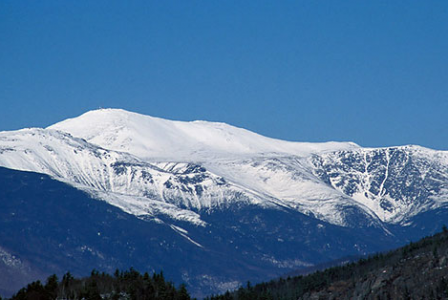 Known for its extreme above-treeline weather conditions, Mount Washington is the highest peak in the Northeast. 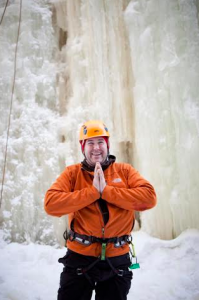 On an ascent of Mount Washington, you will learn basic mountaineering skills, winter navigation, and self-arrest techniques. Space available: Friday and Sunday!!! 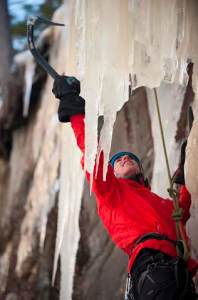 This two-day course on Saturday and Sunday is designed for experienced ice climbers who are ready to take on the sharp end. 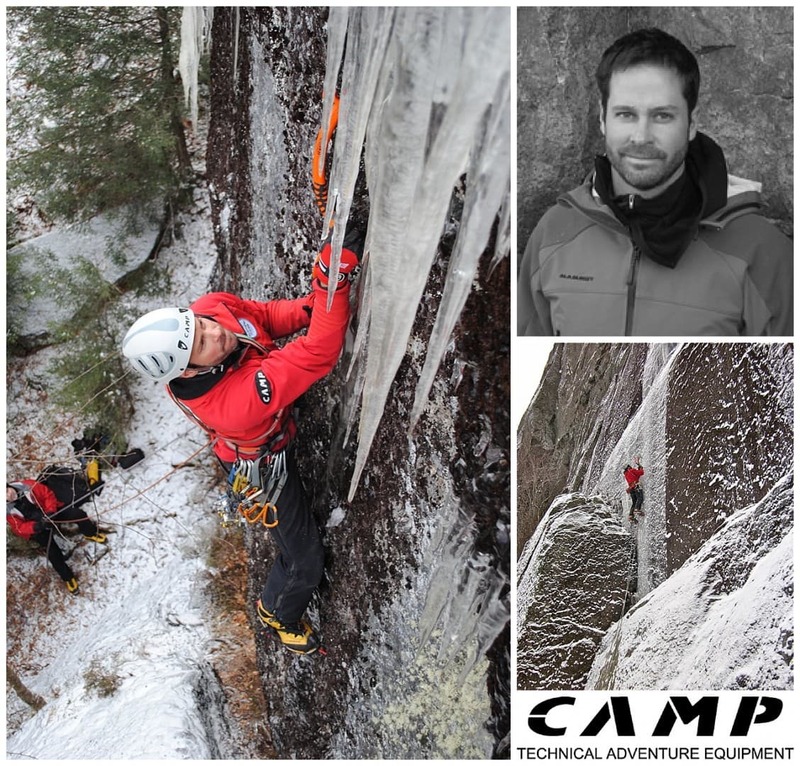 Transition confidently into leading with instruction from IFMGA/UIAGM certified guide Adam George. Reserve a spot while they are still available!